About Staffordshire trailed slip, the history, manufacture and examples. When collecting slipware ceramics, it is important to have knowledge of the history and the challenges the medium presents to appreciate its value and artistry. Slip ware ceramics, are created by dipping the object in pale slip then trailing other colours of slip over the top in intricate patterns. 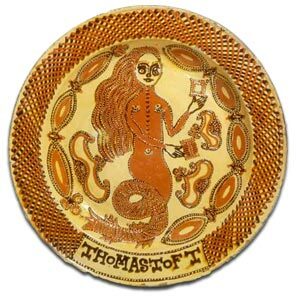 Thomas Toft, who is known to have worked between 1660 and 1680, is the best know of the 17th century slipware potters and there is said to be about 30 Toft pieces still known to exist today. Another famous slipware maker of the Toft family, was Ralph Toft, possibly Thomas Tofts brother or son, who is thought to have worked around 1675. There was also a Cornelius Toft and James Toft. Other potters working in the style were Ralph Turnor, William Talor, Ralph Simpson and Richard Meir. Designs attributed to Thomas Toft include mermaids, unicorns, pelicans, and also King Charles II and his wife Queen Catherine of Braganza, and numerous coats of arms. 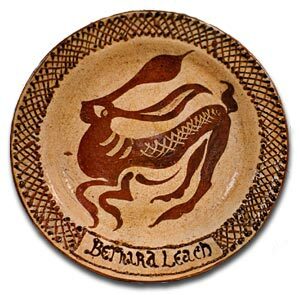 A cross-hatched rim was fairly typical of his style and is copied by many 20th Century slipware potters, inlcuding Bernard Leach. The Paul Spence and Bernard Leach pieces shown below show how they have tried to pay homage to Thomas Toft. Both borders are pure Toft, right down to both Spence and Leach signatures. The Leach central motif of the jumping rabbit however betrays a Japanese approach to pattern and image and the Spence portrays a more traditional armorial feel. Slipware ceramics may seem rustic, but their creation requires great skill. Slipware is earthenware pottery decorated with slip, which is a mixture of clay suspended in water, with lead based glaze applied on top. Functional and decorative, the slip creates a stronger bond with the glaze than earthenware. The working time of slip is very short and it must be stirred constantly to keep it in suspension. It stiffens immediately when placed on a dry surface so mistakes made must remain or be wiped off. Five thousand year old fragments of slipware ceramics have been found throughout Asia and Europe. Chinese feather brush slipware from 200 BC also exists. Although beautiful, feather brushing slip is very difficult to control and the lines must be painted over multiple times to be even. The Italian tradition of sgraffito and marbleized slipware began in the 15th century. It was followed in the 16th century by potters in France, Spain, Germany, the Netherlands and England. Sgraffito is the only subtractive method for using slip. Leather hard plates or vessels are coated with slip, which is then scratched off with a pointed tool or stylus to create the decorative designs. Plates are normally slip-coated only on their face, and vessels only on the outside. Slipware Marbling is created by applying two or more contrasting slip lines onto a slab or vessel using a slip cup with multiple tubes. The vessel or slab is rotated, tilted and wiggled to allow gravity and centrifugal force to move the slip lines into a marbleized pattern. Potters must know accurately, how long they have to work before the slip is too dry and when to stop so the pattern does not become a muddy mess. Slipware Combing, using a tool similar to its name is applied over the marbleised slip. 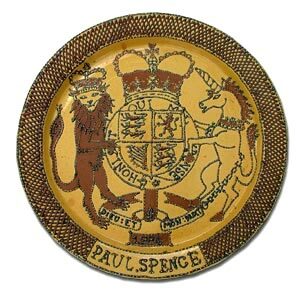 In England during the 17th and 18th centuries some of the greatest examples of slipware ceramics were produced. Some notable English potters producing slipware ceramics of that time are Henry Ilfield and George Richardson who worked in Wrotham, Kent. The Wrights at Harlow, in Essex, made sgraffito Metropolitan Slipware for London by carving patterns into the clay, which were then filled with slip in an inlay process. 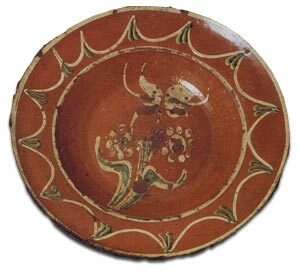 Slipware ceramics have been produced in the Staffordshire region from the mid-17th century. The first, well known, Staffordshire slipware products were the elaborately decorated ornamental dishes and chargers popularly called Toft Ware, after the Toft family of potters. Thomas Toft and his relatives are the most famous of them all, although it is unclear whether they were potters or simply commissioned the pottery. Made in Burselm, Staffordshire, Toft tableware and presentation platters used the slip-trailing technique to create their original designs of mermaids and unicorns along with coats of arms, notable figures and distinctive cross-hatched rims. When slip-trailing a container called a slip cup, which is made with a small hole to which a tubular reed or quill is attached, is used to trail the slip over the plates or pottery vessels. The slip must be constantly agitated and the tubes cleared during the application. Staffordshire Trailed Slip Ware Ceramics use thin buff-bodied earthenware coated with white and dark slips and decorated with trailed, combed, or marbled designs. White slip covers more of the surface than the dark slip and a clear lead glaze gives the piece a yellowish background color. Sometimes these are reversed to produce a brown bodied vessel supporting yellow decoration. They were in production by around 1660, and continued to be made into the 1720s. Slip painting was also widely used in Egyptian pottery, where animal and scenic motifs are painted in white slip on a red body. North American Indian wares, use a form of slip decoration that shows trails of slip used in the way you might ice a cake, where a design is achieved using contrasting lines of colour. With further moulding carried out or simple small blobs of slip dropped on to the vessel and then moulded or stamped with a raspberry or rosette. Collecting good slipware ceramics, means knowing how much work an artist has put into producing what looks like a fairly rustic item. And; seeing the underlying beauty and rarity in what can be simple crudely executed trailed slip designs.